A block quotation (also known as a long quotation or extract) is a quotation in a written document that is set off from the main text as a paragraph, or block of text, and typically distinguished visually using indentation and a different typeface or smaller size quotation. (This is in contrast to a setting it off with quotation marks in a run-in quote.) Block quotations are used for the long quotation. The Chicago Manual of Style recommends using a block quotation when extracted text is 100 words or more, or at least eight lines. Oh hey, that's a block quote right there. Essentially you should use a block quote whenever you'd like to have a block of text stand out from the rest of the text both above and beneath it, usually when quoting another person or source. The block quote element can be found under the Basic category of elements when editing a blog post and under the More category on a regular page. Using this element is a matter of dragging it between two other elements. You can't drag it into the middle of a single paragraph element, so if you want to use it you need to break your text up into at least two elements. Editing a block quote is just like editing any other text element; you have access to the same black toolbar and basic editing functions. The look of a block quote is based partially on the style of the theme. Some themes have more subdued block quotes and others are a bit flamboyant. 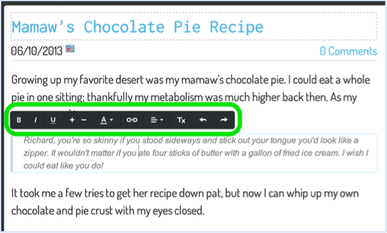 Outside of the basic changes available via the element text editor shown above there's no option to alter this look from theme to theme.